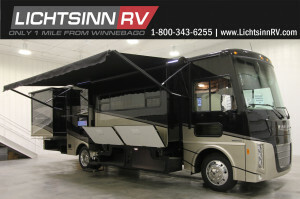 When you take this Sightseer Class A gas motorhome with you on your next weekend getaway, you will forget about the way that life used to be when traveling in an RV. From its elegant private bedroom with a queen-size bed, large wardrobe, two nightstands, and a 28″ HDTV, to its comfortable central living area with a Glide & Dine table and chairs, comfort sofa sleeper, and recliner, you will wish you had chosen to travel in this coach sooner. With a Sightseer Class A gas motorhome, you get the ultimate traveling experience. The fully-loaded cab area will make it fun for you to get to each vacation destination with its multi-adjustable cab seats that slide, recline, and swivel and its multimedia color touch screen. The OnePlace systems center that has been included in the Sightseer is a very handy feature that allows you to monitor and control key systems from one convenient location, instead of having to walk back and forth between the thermostat and the generator, and the 50 AMP power cord will ensure that you will always be able to enjoy the many modern conveniences that the Sightseer has to offer. Water Heater Capacity 10 gal. Basement Storage 104 cu. ft.
See our in-stock, Sightseer 33C inventory here.